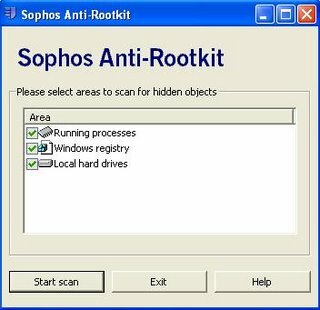 Rootkits are very cleverly designed to hide an intruder's presence on your computer so it's very difficult to tell if someone is spying on your activities. Intruders can even be corporations as when Sony music CDs installed rootkits onto customers' computers to implement DRM. While there's no sure fire way to tell if you have a rootkit installed on your computer, there are a few tools that can help you find and detect them. One from Sysinternals called RootkitRevealer can help you find rootkits, but not root them out. Oftentimes, you'll see something flagged as being a possible indication of a rootkit, but there are a lot of false positives. Look at the help file for more information about false positives. Make sure to backup your registry if you decide to do delete and change things in your registry. The second tool from Sophos is called Anti-Rootkit which detects and removes rootkits. It's very simple to use. When I ran it, it finished scanning my computer very quickly. Use the direct download below if you want to avoid the registration page.